Surge Exploration Inc. (TSXV:SUR, OTCQB:SURJF, FRA:DJ5C) is pleased to announce that the planning and budgeting for the 2019 exploration program is underway on the recently acquired group of nine claim blocks comprising 19,665 hectares (197 sq km) in the Omineca region of north-central British Columbia (See original acquisition News Release dated November 28, 2018) . Initially a two-phase exploration program is being proposed by the Surge Geological Team. Phase One will be carried out on lower elevation terrain once spring breakup takes place and will involve reconnaissance prospecting, geological mapping and a heavy metal panned concentrate sampling survey of all relevant drainages within the claim blocks. Phase Two is planned to follow-up the work completed in Phase One as well as to extend the initial surveys into the higher elevations of the claims as winter snows retreat. Contingent on Phase One results, follow-up could also include additional soil sampling, geophysics and trenching. The Omineca Group of 9 claim blocks (see map) lie in the Omineca Mining Division of north-central British Columbia, approximately 150 km north of Fort St. James. The claims are 100% owned by Surge, subject to TSX Venture Exchange (“Exchange”) approval and are not subject to any royalty terms, back-in rights, payments or any other agreements and encumbrances. B.C. Minfile assessment report data indicates that most of the area covered by the Omineca Group claim blocks were at one time or another covered by staking during surges of exploration in B.C. dating from the 1940’s to present day. Largely the claims appear to have been minimally explored with little follow-up. However, some work was recorded on several claims with results for stream sediment sampling showing anomalous to highly anomalous results for gold in a few areas. These areas were recommended for detailed follow-up, however due to a previous commodity price downturn no further work was recorded. Prominent among early discoveries in BC’s Omineca Region is the nearby Lustdust/Stardust property (Sun Metals Corp. TSX-V: SUNM) currently under option from Lorraine Copper Corp. (TSX-V:LLC). This property covers a large, coherent integrated porphyry-skarn, epithermal system. The project has notable drill intercepts such as 15 meters grading 24.04 g/t gold and 2.2% copper (hole 02-09); 9.7 meters grading 36.7 g/t gold, 182.6 g/t silver and 2.89% copper (hole 02-03); 59 meters grading 0.67 g/t gold and 0.80% copper (hole 01-44); and 5.0 meters grading 13.3 g/t gold, 899 g/t silver and 6.8% combined lead-zinc (hole 03-09). These results were publicly disclosed in a News Release by Sun Metals Corp and by Lorraine Copper Corp. (News Release) on November 14, 2018. 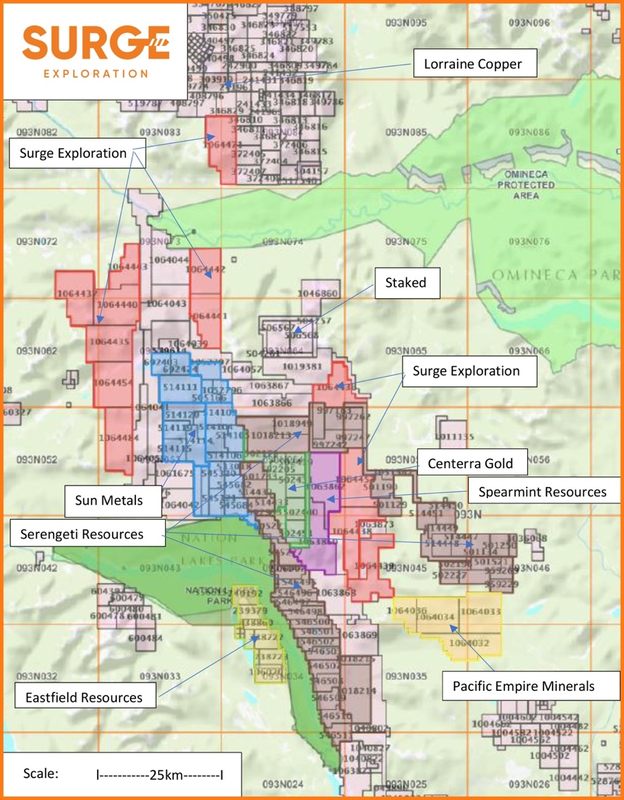 Other notable projects nearby to the Mineral Mountain property, include the Kwanika property (Serengeti Resources Inc./POSCO Daewoo TSX-V: SIR) a promising advanced stage copper-gold project; the Lorraine property (Lorraine Copper Corp. TSX-V: LLC) which is the host to a large copper-gold National Instrument (NI) 43-101 compliant resource. The Lorraine Copper Corp. tenures are located between the Kemess North project being developed by Centerra Gold’s subsidiary Aurico Metals and Centerra Gold’s operation at the Mount Milligan mine. The Stardust Property contains a NI 43-101 compliant mineral resource, known as the Canyon Creek deposit, completed by GeoSim Services Inc. in 2010. It contains an indicated mineral resource of 1,253,000 tonnes grading 1.33% Cu, 1.426 g/t Au and 33.0 g/t Ag with a copper equivalent cut-off grade of 1.0%. An additional 3,124,000 tonnes grading 1.12% Cu, 1.366 g/t Au and 25.4 g/t Ag is classified as inferred. The presently defined mineral resource extends some 600 m along strike and down dip and remains open in all directions (this work was fully disclosed in the Lorraine Copper News Release June 20, 2016). Mineralization hosted on nearby and/or adjacent properties is not necessarily indicative of mineralization hosted on the Company’s Mineral Mountain Property. The technical content of this news release and the NI 43-101 technical reports have been reviewed and approved by Paul Sorbara, P.Geo., an independent consulting geologist and a qualified person as defined in NI 43-101. The Atacama Cobalto Project is located in the Atacama Province in northern Chile, 15 km northwest of the town of Copiapo, where mining is the largest economic activity, and the mining industry is one of the region’s major employers. The Atacama Cobalto Project consists of 1,059 hectares and is located only 3 km East of the Cerro Iman Mine. To date, CAP Mineria has drilled over 20,250 m on the Atacama Coblato Project. As announced on November 28, 2018, Surge has acquired, subject to Exchange approval, a 100% interest in 9 claim blocks comprising 19,665 hectares (197 sq km) in the Omineca region of north-central British Columbia, approximately 150 km north of Fort St. James. The claims are not subject to any royalty terms, back-in rights, payments or any other agreements and encumbrances. The region is host to numerous operating mines, good infrastructure including experienced exploration and supporting services. B.C. Minfile assessment report data indicates that most of the area covered by the Omineca Group claim blocks were at one time or another covered by staking during surges of exploration in B.C. dating from the 1940’s to present day. Prominent among early discoveries in the Omineca region were the nearby Lustdust/Stardust property (Sun Metals Corp. TSX-V: SUNM) covering a large, coherent integrated porphyry-skarn, epithermal system; the Kwanika property (Serengeti Resources Inc./POSCO Daewoo TSX-V: SIR) a promising advanced stage copper-gold project; the Lorraine property (Lorraine Copper Corp. TSX-V: LLC) host to a large copper/gold NI 43-101 compliant resource. The tenures are located between the Kemess North project being developed by Centerra Gold’s subsidiary Aurico Metals and Centerra Gold’s operation Mt Milligan mine. The transaction is subject to TSX-V approval.